Guns: Army Armament R85A2, G&G CM18 MOD1, WE F226R E1, Well MkVI Webley .455, KJW Glock 23. Loadouts: British Army MTP Plus Osprey Mk.IV if I want to be exhausted, £4 worth of well-used DPM kit. -365FPS - A little hot. -Easy to access Battery, and Large space. Like I said - Not looking for advice on if I should get and L85, It may be a bad Idea But I've already decided. If Anyone's got any other tips on British Equipment, Or L85's They'd be Welcome. As I mentioned in the other thread. Ics all the way. The quick Spring change is a dream, gun fires really well aside from its little selector issue. But that's easily remedied as long as you keep a check on the tightness of the screw that holds it. I never had an operational issue with mine really. You also have gone bonus of ic's' approach to the trigger set up and gear box set up. I ran mine on a pair of LiFe batteries as they fitted into the Daniels defence rail. to me the SA80 or L85 type guns are often a gun "you think you want"
Yeah, I am going for a British Loadout tho... I'm planning on Seeing if I can find a shop with L85s, See If they'll let me handle one. Like I said - It'll be a while before I can get one anyway, So I've got plenty of time to Learn more about them. ICS is the one to go for currently. An expensive route, a lot of the kit you won't really need, but looks the part nonetheless. Go for it! Yeah, Still not entirely decided between the G&G and the ICS. But I am leaning towards the ICS- Since the EBB Just seems too much hassle. EBB is poop anyway except in a few select gats. I assume you mean the Osprey vest and not helmet? If so, which one? The mk 5 can make you sweat a slow death if you're not used to wearing a plate carrier as they're obviously intended for as much protection as possible, so just be wary of that. Just be aware that with the receivers of the L85 being steel they weigh quite a bit more than an M4/M16 variant, which is mostly plastic. Yes they do look good (I had 3 at one stage in different configurations) and if you are carrying them around all day at a skirmish then you will notice the weight after a while. If you do get one make sure you get the proper SA80 sling for it, as it makes it much easier to be able to convert from a 3 point sling (carrying) to a single point sling (shooting). Just make sure you know how to attach it properly though. 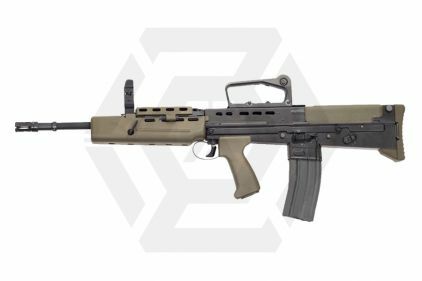 If you go for a G&G then it will take parts from the ARMY version if needed, as the parts are interchangeable, unlike the ICS version. 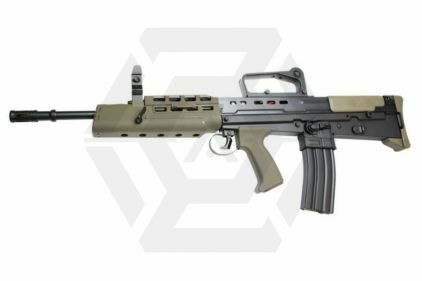 Don't get me wrong, the g&g its easy enough to disable the ebb, and swap out the sector gear to get rid of the pre cocking/charging, swapping the piston etc etc. The sling for the L85 is one of the best pieces of kit the Army had, the A1 rifle was flawed until the H&K upgrade A2 version but the sling is great. Would not use any other with it, especially a single point. So... Not the Single point then? can you give me a picture so I know what to look for? As already said, the full L85 slings are absolutely awesome. Really make using a pretty awkward gun a lot more comfy in my opinion. Not sure if it would be so fun with an osprey on as I only use a belt rig and harness with my L85 but both slings don't cost too much so might be worth giving them both a go anyway just to see which you prefer.